Hang Buom street old belong Ha Khau award (also known as Giang Khau), Tong Huu Tuc of Tho Xuong district, where the river flows into the To Lich river. On the estuary was filled, but the stree is still. Hang Buom original is not the focus of the Chinese people., they are in Viet Dong street (now Hang Ngang) and in spread to several surrounding cities such as Hang Bo, Phuc Kien street (now known as Lan Ong street). By the 19th century, from the Chinese people in Hang Ngang street area until this expansion, manipulated and eventually the whole city. Quang Dong club-house at number 32 with a layer of green glaze tiled roof and small ceramic statues are featured, there is now a nursery school. Former Hang Buom street fair next to the Bach Ma Temple (White Horse temple) had Bach Ma market after market along with Cau Dong market gather to the Dong Xuan market. French colonial period, French street names as “Rue des Voiles”, was translated into Vietnamese to Hang Buom. After 1954, the street was officially named as now. Hang Buom street from east to west length of about 300m, past a place that sells all kinds of sail. Sails made of fabric or woven rush for the boats. Product of the street was that the type of equipment, bags, blister sailing, sailing … woven by rattan, rush. Raw materials are transported by boat to get close to the city, and the boat was also carrying products to other places. After the Chinese people dominated the street, the item disappeared. They open more restaurants in this street. According to documents left behind, the presence of Chinese business people in Hang Buom started very early and probably from the 19th century, this street has become a Chinatown. When the French arrived in Hanoi in 1872 it was very crowded Chinese people in Hang Buom and there are the Association of Management. This period, many Chinese merchants who also defied the law of the court, secretly traded with the French traders and people do spy. Fluctuations in the years from 1873 to 1882, in Hanoi happened many wars, the French were over 2 times invaded, the streets were arson, looting, particularly in the Chinese people in Hang Ngang, Hang Buom still keeping a noisy scene, a crowded mall. At Hang Buom that time there is definitely up in the port of head street, a night watchman. In the first period, the French have not yet built structures should be used Quang Dong hall as the place of meeting, when a grand reception. This stage, Chinese people traders get rich quick and focused more crowded here, the Vietnamese people gradually moving in that city to the other,Hang Buom turned into a “Guest street” with shops of Chinese wealth, prosperity. Hang Buom the streets to keep the look the most durable commercial challenges of history. Even during the opening night of the first 60 days of resistance against the French this is the area both as a place for combat leave out “non-military.” Contact Resistance Committees Area I to allow stores of Chinese people overseas trade opening should be free of this street were the only place in Hanoi with the bustling service activities. One of the two military medical station of inter-region I was located at 26 Hang Buom. Hang Buom street but also a few architectural changes over time, although most also had a few houses were rebuilt. On Hang Buom still many religious relics and revolutionary relics: the famous Bach Ma temple is located at number 76, Long Do temple worship, the Eastern townships of the ancient Thang Long, the Bach Ma temple structures is quite large, in-depth planning, starting Hang Buom street to Ngo gach lane, built in the Southeast, close Hang Buom street. Also, on Hang Buom also Tu Duong communal house located at number 8, common people still called because Hang Thit temple because Hang Thit ward originalin Kim Nguu, Van Giang district, Hung Yen province to Thang Long practice formed. 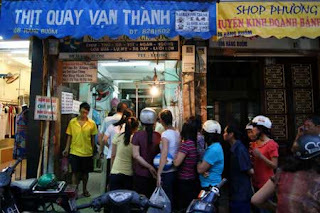 Hanoi people come to Hang Buom today not only to find memories of a crowded shopping mall past but also to be immersed in ancient space characteristic of the 36 streets. 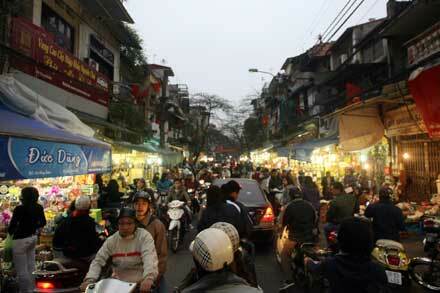 Next articleWho renames streets of Hanoi? I remember going here when I was in Hanoi. Nice city, loved the lake!! !